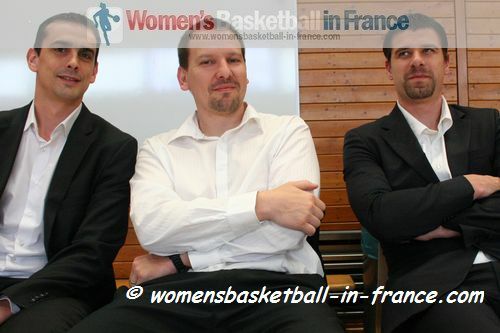 The best U16 youth basketball players are to compete in the towns of Albena and Varna in Bulgaria during the U16 European Championship for Women Division A.
Julien Egloff, the French coach, has been very busy since 14 May 2013 with his preparations. His team won the U16 Women Dussman Trophy at the end of May which they followed up with a second-place finish at the Laure Ecard's 4-nation tournament in Nice at the beginning of July. France took park in the European Youth Olympic Festival (EYOF) in which they came away with the silver medal. The 12 players selected for the European Championship completed their preparation with a two-match series against Serbia. France lost the first game to Serbia (51-64) with Chloé Mantelin and Ornella Bankole finishing with 14 and 10 points apiece. Serbia had four players in double digits: Katarina Zec and Jovana Subasic with 11 points each while Aleksandra Katanic and Marija Stojiljkovic both had 10 points. The second match was much closer with Serbia still coming out on top (61-56). Ana Tadic and Aïda Sow led the scoring with 12 and 10 points each for France. For Serbia Aleksandra Katanic, Jovana Nogic, Kristina Arsenic scored 17, 15 and 10 points each. Julien Egloff and his coaching staff of David Gallois and Xavier Noguera have selected the following 12 players for their European Championship U16 campaign: Camille Lenglet, Alexia Chartereau, Francesca Dorby, Margot Bienvenu, Chloé Mantelin, Fleur Afonso, Lisa Berkani, Ornella Bankole, Ana Tadic, Manon Boehrer, Alexandrine Obouh Fegue and Aïda Sow. France are drawn in Group D with the Czech Republic, Hungary and the Slovak Republic. In order to qualify for the 2014 FIBA U17 World Championship for Women in the Slovak Republic it is important to finish in the top 5.